HomeNews & MediaNewsletterSkin Anti-Ageing – What’s Right at What Age? All of us want to look and stay young no matter what our age, and whether female or male. Good sun protection, a good diet and healthy living are all part of maintaining good skin. However, ageing is a natural process which unfortunately cannot be stopped and although it affects each individual differently, there are certain general strategies for the prevention and treatment of the condition based on extrinsic factors and the physiologic changes of the skin. Mr Allen Rezai shared with us the strategies and methods he uses to help fight off and ameliorate the signs of ageing in his patients, taking into consideration genetics, age range, lifestyle and skincare. According to Mr Rezai, for the best understanding of the most suitable options, it is convenient to consider specific broad age groups and what their typical needs are found to be. And this applies not only to women but also to men, whose skin care needs is not dissimilar to those of females. Men are increasingly concerned about their appearance and many today turn particularly to non-surgical rejuvenation treatments in order to retain or regain their youthful image and with it their self-esteem and confidence. ding to Mr Rezai. Despite this knowledge however, adolescents and young adults are still the most likely to tan and use tanning beds. Beautiful skin in your forties and fifties starts when you’re in your twenties! “Our initial goal is to educate our patients on the importance of minimising sun exposure and practicing sun safety as UV damage is one of the main causes of extrinsic ageing. If a person’s skin takes the brunt of unprotected UV exposure from their teens onward, their skin can appear discolored, dehydrated and aged far earlier than someone who chooses to wear broad-spectrum sun protection every day. Damage prevention is better than cure, and protecting and caring for your skin now by having a good skin care routine and applying broad spectrum sunscreen daily is fundamental to preventing premature wrinkles, age spots and skin cancer caused by harmful exposure to the sun. It is important to be aware that most of the damage to a person’s skin that becomes visible in their thirties and forties has actually been there since their twenties – it simply wasn’t visible. So if the skin isn’t looked after in earlier years, the visible signs of damage will appear in the future.” says Mr Rezai. So what should Young individuals do to protect their skin and prevent Pre-mature ageing? The skincare regimen for teenagers and individuals in their 20’s should typically be simple and basic, starting with products that are not overly abrasive and contain adequate humectants to preserve moisture. Preventative products such as antioxidants, and a good topic vitamin C and E product, should also be introduced to individuals in their 20’s. Mr Rezai is strongly against exposing young individuals to non-surgical cosmetic procedures such as Botox and dermal filler wrinkles treatments or strong peels, as in almost all cases there is no right indication to start these types of treatments when in your 20’s. Generally, people who are not seen for skin conditions in their teens or 20s will wait until outward signs of ageing begin to appear before visiting a cosmetic surgeon or dermatologist. 30’s is the time when physiological changes characteristic of ageing begin to manifest. Mr Rezai explains that “In the thirties, skin becomes thinner and finer, and collagen starts reducing. The complexion also begins to dull, resulting from the slowing down in the speed of cell regeneration. Fine lines and wrinkles start to develop, particularly around the eyes and mouth, and there may be some discolouration caused by sun damage or melasma due to excessive oestrogen. Even those who have taken good care of their skin when younger are still likely to have skin that is uneven and less radiant. People in their thirties will generally focus on treatment, not prevention, and I tell them that they should still be equally as focused on prevention.” says Mr Rezai. Moving into their 40’s, according to Mr Rezai, people start noticing cumulative sun damage resulting in blotches, red spots and ruddiness. The skin also becomes less elastic and will retain less moisture. Now the main areas of concern are the eyes and brow region. The effects of ageing and sun damage develop further, resulting in loss of facial volume and moderate to deep wrinkles in the areas of repetitive expression such as the forehead, brows, and eyes. Mr Rezai goes on to explain that “For women, menopause also plays an important part in how the skin changes, as the decreased oestrogen slows the production of sebum, resulting in decreased protection and drier skin. Facial hair can also begin to appear, due to an imbalance of male and female hormones. Mr Rezai explains that his preference is for a comprehensive and holistic approach to skin care involving first of all prevention and protection, then following up with correction where needed. Research shows that ageing skin is the result of more than just natural ageing. Exposure to environmental elements like sunlight, smoke and air pollution are extrinsic factors causing pre-mature ageing of the skin which not only leads to the formation of lines, wrinkles and discolouration, but can also lead to serious skin conditions, including skin cancer. Lifestyle choices, including smoking and alcohol use, can detrimentally influence skin ageing, but the most important factor in the prevention of pre-mature skin ageing is UV protection, which includes minimising sun exposure, using sunscreen, and wearing sun-protective clothing, according to Mr Rezai. In support of a healthy lifestyle, diet and exercise can also benefit skin appearance. “Nourishing your body is essentially nourishing your skin. Exercise has been proven to reduce the instance of many diseases and bone loss, as well as slowing the onset of dementia. Increased heart rate and blood flow, the results of exercise, also help to flood the skin with oxygen, which is necessary for healthy skin to function optimally. So the person who exercises, keeps a balanced diet, and drinks plenty of water will naturally look better and have healthier skin than someone who doesn’t” Mr Rezai says. 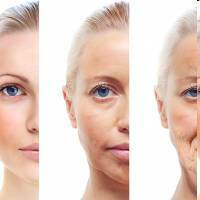 “All of these aspects come together to determine how someone’s skin will age. Damage Prevention to skin is better than a Cure, by applying adequate sun protection, having appropriate skincare routine and maintaining a healthy lifestyle and diet, one can keep premature signs of ageing at bay and age gracefully. And when the indications of ageing appear, there are various non-invasive Anti-Ageing Solutions available which can be specifically tailored to suit the individuals need for a Youthful but Natural Appearance.” concludes Mr Rezai.